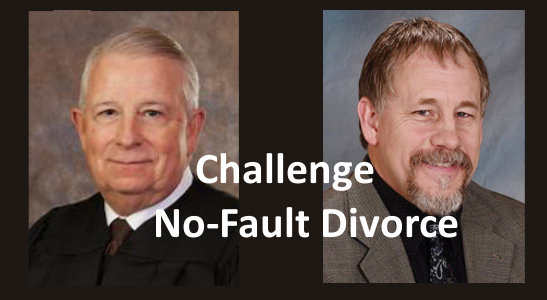 In Nebraska, attorney Bob Sullivan is assisting a Catholic divorce defendant challenging the constitutionality of no-fault divorce in the District Court of Adams County. 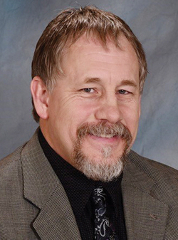 Besides practicing law for almost 25 years, Sullivan writes about his faith for Crisis Magazine, the Lincoln Diocese’ Southern Nebraska Register, and blog thosecatholicmen.com. Mary’s Advocates has obtained public records of Sullivan’s work. Sullivan is indirectly shining a spotlight on the unfair practice of Catholic marital abandoners. DIVORCE: No-fault divorce is the way for an abandoner to cash in on the government’s reward paid to one who reneges on her marriage promises. The government extorts the reward payment from her husband, while enriching mercenary lawyers. At the time of divorce, an abandoner cannot honestly describe any specific abuse because there is none. She tells her acquaintances that she had to split from her husband and blames the breakup on him. However, months/years later, she gets a decree from the Church saying the marriage split up because she was incapable of marriage consent. In no-fault divorce, an abandoner is never asked to prove any fault of the other spouse justifying permanent separation. Catholic husbands — who have done nothing grave to morally justify separation of spouses and have provided comfortable living for their wife and children — are kicked out of their own home by divorce judges. Children lose everyday access to Dad. A husband is ordered to give his wife half the property he earned during his entire career, plus pay her spousal support and attorney fees. ANNULMENT: After the civil divorce, the Catholic wife petitions and obtains a Catholic decree of invalidity of marriage on the most popular ground in the USA, canon 1095.2, which is for one who was “incapable of contracting marriage” because she supposedly suffered a grave psychic anomaly at the time of marriage (See Catholic annulment statistics here). About annulments, the Lincoln Diocese website shows “the process is directed to discover the truth” (source). If it is true that a woman was incapable of consenting to marriage because she was mentally incompetent on the wedding day, then it is not fair for the non-husband to give her half the property he earned during his entire career. Spousal support is not owed to a woman who was never a man’s wife. Furthermore, mental incompetence is relevant to her ability to raise children. The Nebraska-wife alleged parties were lawfully married on their wedding date, but lawyer Sullivan said that defendant lacks sufficient knowledge to answer her allegation (because he doesn’t know if the marriage is valid). She alleged that the marriage is irretrievably broken and he says that if the marriage is valid, it is not irretrievably broken. When answering a civil complaint, the defendant has the chance to make his own complaints against the plaintiff, and Sullivan includes the allegation that the Plaintiff-wife did not possess the capacity to enter into marriage on their wedding date (see chronology below). Nebraska law recognizes that if a party “is mentally incompetent to enter into the marriage relation,” then, “the marriage is declared a nullity,” and the “court may order such innocent party compensated as in the case of dissolution of marriage, including an award for costs and attorney fees” (Neb. Rev. Stat. § 42- 103 & 378). The Plaintiff-wife is going to have to answer prior to any divorce trial whether she was mentally incompetent to enter marriage. If she wants the Catholic Church to condone her breaking up her marriage with a Catholic annulment on the most popular ground (1095.2), then she’d have to now tell the truth that she was mentally incompetent to enter marriage. However, this could result in her getting zero spousal support, and possibly have to repair damage she caused the non-husband. Sullivan points out in his April 3 Affirmative Defenses that parties’ vows “constituted an explicit waiver of dissolution without a finding that the marriage was invalid, or without an allegation and finding that one of the parties had engaged in behavior which arranged relief.” Parties accept the obligations of Catholic marriage when giving their consent, so they waive the possibility of a civil dissolution of marriage based on no-fault grounds. For Catholics, adultery is the only ground for permanent separation of spouses. Other grievous offenses justify temporary separation for a determinate or indeterminate length of time to be judged by the ecclesiastic judge. (See Rev. James P. Kelly, Separation and Civil Divorce; 3rd Plen. Conc. Balt. no 124, 126; 1917 CIC c. 1128-1132; 1983 CIC c. 1151-1155). Nebraska statutes shows, “It shall be lawful for every religious society to join together in marriage such persons as are of the society, according to the rites and customs of the society to which they belong” (§42-115). Parties enter “into the contract of marriage” (§42-378). It is unconscionable for Nebraska legislators to assure all Catholics marrying in Nebraska that the state recognizes they marry according to the rites and customs of the Catholic Church, but then when either wants to separate, the defendant and children are forced to accept that parties, instead, become married in accord with the rites and customs of the amoral proponents of no-fault divorce. Sullivan lists constitutional rights provisions violated by the no-fault divorce statutes: Due Process, Bill of Attainder, Equal Protection, Special Law under guise, Exclusive Privilege / Immunity, Takings of private property for public use, Takings, Establishment clause. Defendant cannot defend himself against a complaint that includes no allegations of behavior that is illegal. If the judge grants his wife’s divorce, the judge is making a special law for his wife based on her opinion, nota measure of husband’s behavior. The state is not allowed to take the property of a resident without satisfying certain criteria. The state cannot interfere with freedom of religion except in limited circumstances. The District Judge, Stephen R. Illinworth scheduled trial on June 20 based on issues in controversy in typical divorce, probably before the judge read Sullivan’s affirmative defenses. “The issues to be decided at trial are 1) division of the parties’ marital assets and liabilities; 2) determination as to who shall have possession of the marital residence and exclusion from the marital residence; 3) determination as to payment of spousal support; and 4) determination as to payment for attorney fees” (April 3 Journal Entry/Order). We are waiting for Plaintiff-wife to respond to allegations lodged by Sullivan. At stake is whether the Nebraska’s no-fault divorce statutes shall be ruled as unconstitutional. Of interest is whether Plaintiff-wife is interested in claiming in the civil forum what so many marital abandoners claim in the ecclesiastic forum “I was mentally incompetent to consent to marriage (canon 1095.2).” If she successfully proves in the civil forum that she had a mentally incompetence nullifying her marriage consent, then Plaintiff-wife’s ability to take property earned by Defendant during all those years wherein he provided her a comfortable standard of living will be in dispute, and her right to spousal support will be in dispute. If she adamantly and truthfully denies mental incompetence to consent to marriage, then in the Catholic Tribunal she should not be able to petition for an annulment on canon 1095.2 (the most popular ground in the U.S.A.). Plaintiff-wife divorce complaint shows that she resides at an address of a home owned by her father. 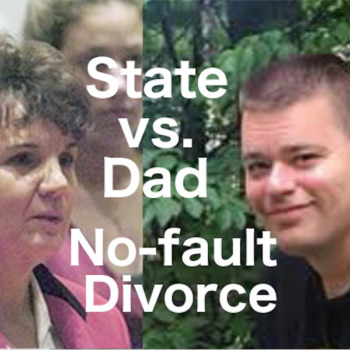 She stated the opinion that triggers Nebraska no-fault divorce, “that the marriage is irretrievably broken” and asked the court to kick Defendant-husband out of the marital home. By invoking the power of the state, she asked the court to award her an equitable share of the property, and force her husband to pay all her lawyer’s fee and ongoing spousal support. See Mary’s Advocates Jan. 7, 2019 story, here. On February 2, 2019, the District Judge Terri S. Harder issued her order “The court overrules Defendant’s Motion to Dismiss” and at the same time ordered Michael to pay his wife’s lawyer $1000 and start paying monthly support to his wife through the government’s Clerk of Court. Lawyer Sullivan needed to learn from the Court when to submit his answer to his wife’s complaint because the motion to dismiss disrupted normal deadlines. 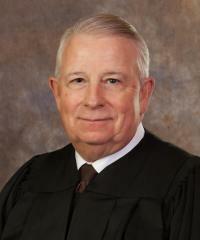 A pretrial conference occurred in March and the original judge was switched to another.